Preis Leistung stimmt, wir hatten einen tollen Aufenthalt. 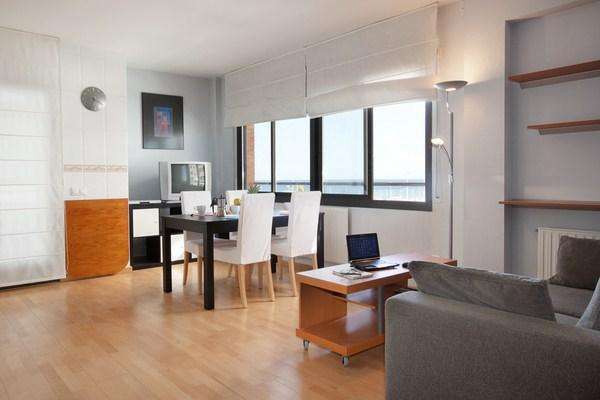 This lovely one-bedroom apartment in Barcelona, is located in Diagonal Mar. With easy access to the beach, as well as public transportation, Barcelona will be at your fingertips! Able to accommodate up to four people, this apartment is great for families or couples making their way to Gaudí´s city. The apartment welcomes guests upon arrival with a simple, yet stylish design throughout. The parquet flooring and large windows allow for natural light to fill the space during the day, adding to the airy feel of this lovely locale. The living room is furnished with comfy double sofa bed, and a TV, perfect for unwinding after a day of sightseeing. And for those who need to get in touch with friends and family back home, a Wi-fi connection is also available. There is a balcony where you can soak up some Spanish sun as you look out over the Mediterranean. The fully equipped kitchen allows guests to create their own home-cooked meals in the privacy of this ideal home-away-from-home. The main bedroom is furnished with a double bed, while the apartment has one bathroom fitted with a bathtub/shower. This charming apartment is a great choice for those who seek a comfortable place to call home!